First of all let me start off by saying this isn't going to be a post about how breastmilk is so much healthier. While I do think if you CAN breastfeed it's beneficial, I don't want you to think if you CAN'T you aren't a good mom. So many things in life can make us women feel inadequate, espeically when it comes to being a mother. When my first daughter was bornI ended up having a c-section because after 2 1/2 hours of pushing it wasn't safe to keep trying via the birth canal. There were many times afterwards that I felt there was something wrong with me. I mean, I had many family and friends that were supportive and told me that it was okay, but inside I struggled for a a few months. There was even a moment when I overheard another mom make a comment about how the doctors wanted to c-section her baby, but she said she refused and said she wasn't going to just give up. She had no idea that I had a c-section and that what she said hurt. She wasn't trying to hurt me, but as a woman I thought I had failed in my main duty of life. So with that, if you are able to breastfeed, you are blessed! Below is a how-to on making that breastmilk last a little farther. I hope it helps. Breastmilk, or as some like to call it liquid gold. Let's be honest, that is the best term for it. Unfortunately, not everyone is able to make breastmilk and those that can aren't always able to make enough. I've seen endless tips on how to make you produce more milk, that is not what this post is going to be about. Instead, I'm going to show you how to make the milk you are able to pump go farther. This tip came from some close friends of ours, they were told it by a nurse/family member of theirs. We ended up having the same nurse when Baby Girl was born and she gave us this same tip. It was really helpful when I went back to work, because we were able to make my milk go a little farther than it would have. So what's the tip? Ice cube trays. Remember my baby food post? If you didn't see it, you can check it out here. You can do the same thing for your breastmilk. 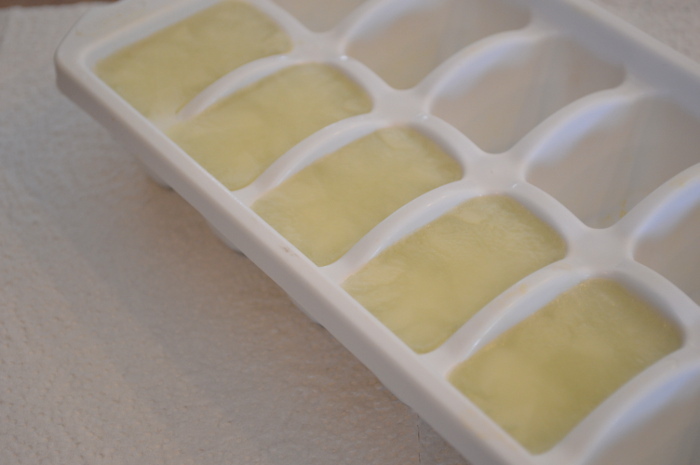 Pump your milk like normal, then pour it into ice cube trays. If you can't do it right away, just stick your milk in the fridge until you can. I usually would wait until the evening to add all my pumped milk into the trays at one time. 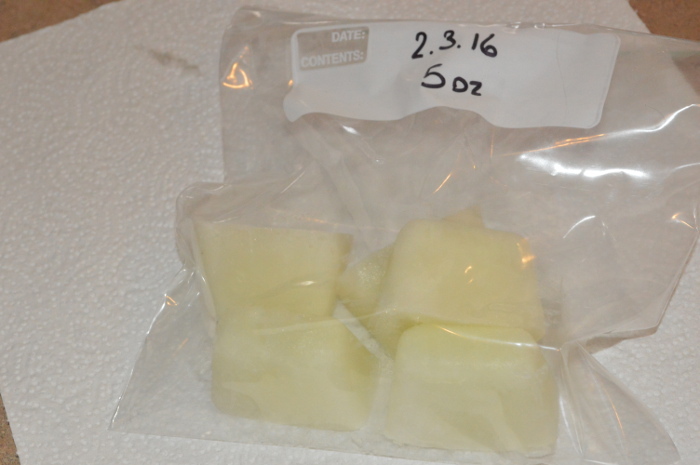 Each cube is about 1oz, depending on your ice cube trays. I let them freeze for 12-24 hours, but try not to longer than that, milk get freezer burn easier than baby food. After they are frozen I place them in freezer bags & mark approx. ounces. I just mark based on 1 cube = 1 onuce. Then I throw them in our deep freezer and then they can last for up to a year. What I like about using cubes instead of nursing bags is that I can pull them out ounce by ounce. With bags, you freeze in sets of bottles, 4oz, 6oz, 8oz etc. However, you may have too many 6oz bags and not enough 4oz and so you ahve 2oz that go to waste each time. With the cubes I can take out what Peanut will eat almost to the exact amount. Now, I will say it's not always perfect, she can be a stinker and still leave an ounce or 2, but when I know she eats only 7oz, I can take out just 7oz. To defrost, there are different ways you can defrost the milk. If we know we will need it ahead of time, I can set it into different bowls and let them defrost in the fridge. Another way to defrost them, is put the amount of cubes you need in a bowl and place that bowl in luke warm water, replacing the water as you need. After a few minutes you can break up the cubes with a fork and then they will defrost faster. Take a funnel and pour the milk into the bottle, and there you have it.